It has been called ‘the silent killer’. It affects nearly half of all Americans (many of whom don’t even realize that they have it) and is the main cause of heart attacks and strokes. Hypertension, or high blood pressure, is one of the most common medical conditions in the country. Hypertension is when the pressure of the blood running through your arteries is too high. Blood pressure naturally rises and falls throughout the day, but the danger is when it stays high for a long time. The reason it is a ‘silent killer’ is that it usually has no symptoms until the condition is urgent. The sufferer can’t feel the pressure of the blood in their arteries and doesn’t feel like anything is wrong. But if it is left untreated, then the risk of heart attacks and strokes increases dramatically over the course of their life. Most people know that hypertension (or high blood pressure) leads to cardiovascular disease and strokes, but did you know that it has also been linked to hearing loss? That’s according to a study conducted in 2013. It looked at 45-64-year olds, some of whom have hypertension and some who don’t. The study found that those with high blood pressure had their hearing affected as their ‘hearing apparatus’ aged faster than those with normal blood pressure. This resulted in their hearing threshold increasing. The quietest sound a person can hear was higher for those with hypertension. 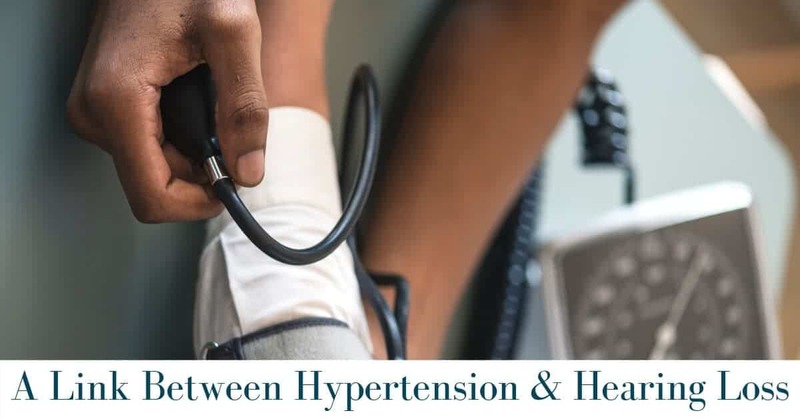 More evidence of the link between hearing loss and hypertension can be found in an article by the American Heart Foundation, in which the researchers found a connection between hypertension and sudden changes in hearing. The study also found that a person who suffered this sudden hearing loss was 150 percent more likely to experience a stroke two years after experiencing the change in hearing. As strokes are usually caused by hypertension, it could be that experiencing hearing loss is an indication of dangerously high blood pressure. What is happening inside the body which makes high blood pressure affect the hearing? High blood pressure damages cells around the body, which also includes the tiny blood vessels which carry blood to the ear cells. If high blood pressure is chronic, there is a real risk of permanent damage to the ears. But luckily, if the high blood pressure can be brought down to a normal level after a short while, then the ears are able to recover from the damage. People may experience high blood pressure due to a combination of nature and nurture. Some people are more likely if they have a family history of the disease. You are also at greater risk the older you get, as our blood vessels are less elastic in our later years. However, there are also lifestyle choices we make that are a major factor in developing hypertension, such as smoking, a lack of exercise, and eating a diet high in sodium. The obvious advice for those who wish to lower their blood pressure is to maintain a healthy diet, regular exercise, refrain from smoking and drinking excessively, and take actions to reduce everyday stress. Of particular interest is the DASH diet, which is a special low-sodium diet for hypertension sufferers. It stands for Dietary Approaches to Stop Hypertension and its proponents claim that it can help reduce blood pressure by a few points in just two weeks. Over time, it can affect a reduction in systolic blood pressure by eight to 14 points. In the meantime, it is advised that people with hearing loss or hypertension have regular hearing and blood pressure check-ups by a healthcare professional. In other words, if you suffer from hypertension, you should get your hearing checked even if you don’t think you have a hearing problem, and vice versa. Your primary care provider can check your blood pressure as part of your annual check-up, and a registered audiologist can provide a good hearing screening. Doing both is important because poor hearing could indicate high blood pressure, and high blood pressure could be an indication that hearing loss could occur soon. The two conditions go hand-in-hand. Keeping this connection in mind could go a long way in preserving your hearing, or more importantly, your life. If you think your blood pressure may be putting your hearing at risk, or you are concerned about your hearing ability for any other reason, a hearing evaluation is of utmost importance. At Hearing Group, we offer comprehensive hearing screenings and hearing aid fittings to help you find the devices that are just right for you. Make your appointment today!